Being Retro: All Circles Have a Start and a END, the end is where you Start! All Circles Have a Start and a END, the end is where you Start! 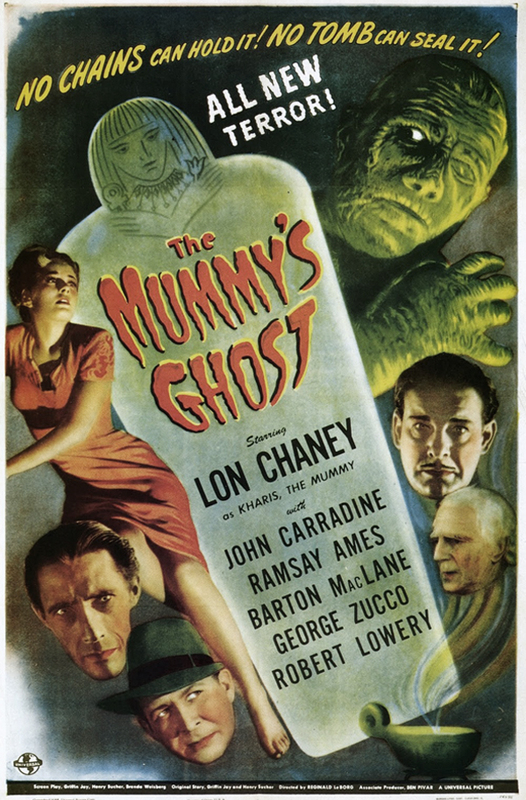 The Mummy's Ghost is the 1944 Universal Pictures sequel to The Mummy's Tomb. Lon Chaney, Jr. again takes on the role of Kharis the mummy. Andoheb, the aging High Priest of Arkam (Karnak in the previous films), has summoned Yousef Bey to the Temple of Arkam to pass on the duties of High Priest. Beforehand, Andoheb explains the legend of Kharis to Bey. Meanwhile in Mapleton, Massachusetts, Professor Matthew Norman, who had examined one of Kharis' missing bandage pieces during the Mummy's last spree through Mapleton, also explains the legends of the Priests of Arkam and Kharis to his History class who are less than believing. After the lecture ends, one of the students, Tom Hervey, meets up with his girlfriend Amina Mansori, a beautiful woman of Egyptian descent. However, a strange, clouded feeling in her mind occurs when ever the subject of Egypt is mentioned. Back in Egypt, Andoheb informs Yousef Bey that Kharis still lives and that Yousef’s mission is to retrieve Kharis and the body of Ananka and return them to their rightful resting place in Egypt. Yousef Bey pledges his devotion before Andoheb explains that during each full moon, Yousef Bey is to brew the fluid from nine tana leaves. Kharis will sense this and find the leaves wherever they are. Hurry, Jeremy, hurry, you must brew the stew! It's the full moon! 1944 was a good year for babies! There certainly was some horror films around then, though I didn't see them. Good to read about films I missed.